Hay, Grass Clippings, Manure, Leaves — Watch Out! Organic materials — that is, things that are or were once living — are the core of “organic” agriculture, and right from the get go, many years ago, I set out pitchfork in hand to gather these materials. Into large garbage pails toted around in my van I loaded manure from nearby stables. Neighbors let me haul away their bags of autumn leaves. Mowings of roadside hay, which I stuffed into the back of the van, were another source of organic matter, used for mulch and for compost. That was before the days of lead-free gasoline, so lead contamination was some concern. Then again, high levels of organic matter in the soil mitigate lead hazards in soils. More dramatically of concern were bags of grass clippings I once dragged across the yard from my neighbor’s freshly mowed lawn. Hours after I had spread the clippings around my potato’s lush, green vines, their stems twisted and contorted as if screaming in pain — the effect of weedkiller used on the lawn. Perhaps my neighbor was striving for a uniform greensward; perhaps he had inadvertently used a lawn fertilizer laced with weed killer. “Weed and feed” sounds so cheerful and labor-saving. Lawn weedkillers are toxic to broadleaf plants, which means anything but a grass. The particular weedkiller was probably 2,4-D, also know as Agent Orange (less cheerful-sounding), which is a synthetic category of plant hormone called auxins. At the right concentration and at the right time, whether natural or synthetic, auxins do good things, such as bending plants towards light, initiating root growth in cuttings and in growing plants, and promoting upward growth Otherwise, they can wreak havoc. I phoned the university extension specialist and was advised to remove the mulch and to adsorb any escaped 2,4-D by mixing activated charcoal into the soil. I did so and subsequent growth was normal. I now have the luxury of scything much of the organic material I need from my own one acre field. Early season mowings are succulent and nitrogen-rich, just like grass clippings. Later mowings are hay, dry and carbon-rich. During the growing season, depending on what and when I mow, I can harvest either end of the spectrum, or anything in between. I no longer rely on roadside mowings as organic material for my plantings. They are nowadays too finely chopped for easy and fast scooping up with a pitchfork. Even if that were not the case, I would have second thoughts about bringing such hay on-site. Again, weedkillers are the threat, more insidious these days because of use of more persistent ones. So-called pyridine carboxylic acid weedkillers might hang around in the soil or on sprayed vegetation for anywhere from less than 30 days to several years, even in the manure from animals that have eaten sprayed vegetation! I do still occasionally supplement home-harvested organic materials with imported ones. One source is horse manure from a local stable. A few weeks ago I was pitching forkful after forkful of manure into the bed of my pickup truck when I glanced over at the far side of the pile and noticed some discarded hay, much of it still pressed together in partial bales. “How convenient,” I thought, for mulching, compost, or bedding for my chickens and ducks. On my drive home I started thinking about that hay riding behind me. Could it be laced with weedkiller? For the most straightforward answer, I could just ask the stable owner. A stable hand told me that the hay had been shipped from a few hours away. Rather than cross examine my manure donor, I looked closely at the hay to see if any clover, alfalfa, or other broadleaf plants were mixed in. No. Of course, lack of broadleaf plants does not prove that weedkiller was used. My final recourse was to do a bioassay of the hay, essentially, to plant seeds in it and observe their growth. 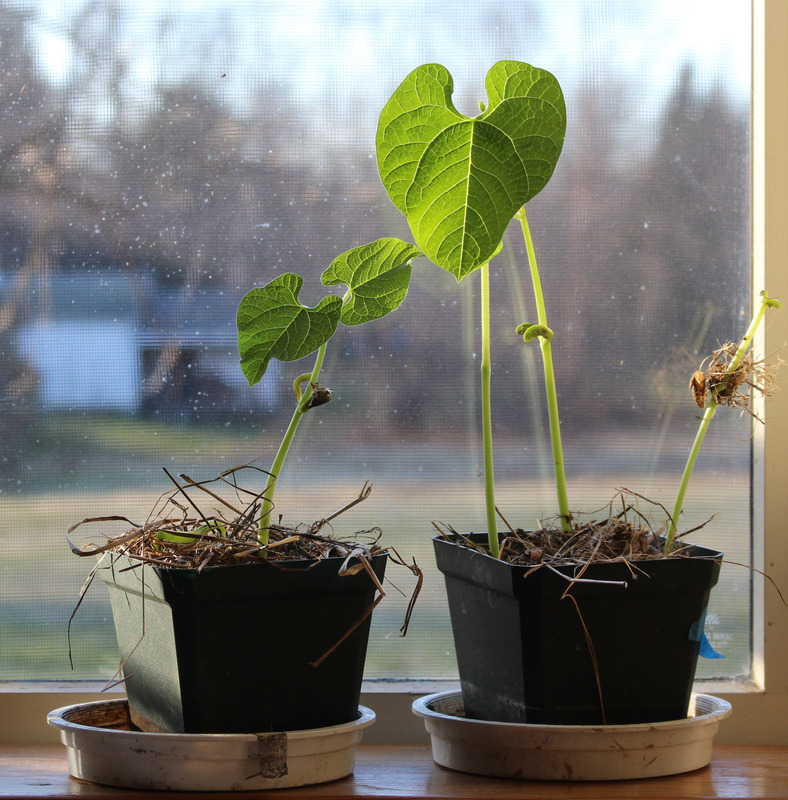 Two 4-inch flowerpots, one with chopped up, homegrown hay and the other with the chopped up, imported hay, served as growth media, into which went 3 bean seeds each. Long story short: Growth seemed normal in the imported hay although germination was slower, probably because its texture lent itself to more readily drying out. To put my mind thoroughly at ease about the hay, I’m going to let the pile sit for a few months, where rain, sun, and, eventually warmth, can do their job in splitting apart the insidious weedkiller molecules. The hay is not for my compost, in the dark innards of which weedkillers, if present, would be particularly persistent. Just like the old days, I do still import organic materials in the form of bagged autumn leaves — except a lot more these days. They are both weed- and weedkiller-free. If you’d like to join me on a brief journey back into summer, see www.leereich.com/videos for a new video, I made last summer, about how to prune that quintessential summer vegetable, tomatoes, just like the Godfather. This entry was posted in Gardening, Soil, Vegetables and tagged 2, 4-D, auxin, bioassay, hay, herbicide, manure, organic matter, video, weedkiller. Bookmark the permalink. Trackbacks are closed, but you can post a comment. This is interesting Lee about the new kinds of persistent weed killer! Thanks for the post! So many factors to consider! 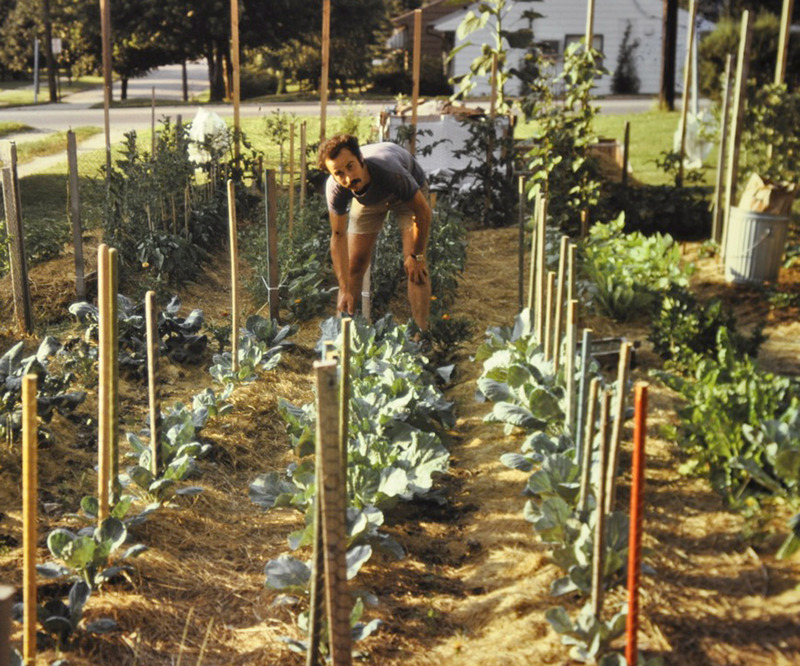 I vividly remember photos shown to us in Master Gardener class of glyphosate damage on vegetable plants – so twisted and distorted. One has to wonder how those chemicals affect us longterm. I also remember a particular episode on Growing a Greener world where Joe used mistakenly treated hay(?) in his new vegetable bed with dire consequence. I rely on all of my own compost although I do want to try some Moo Poo tea one of these days. For shame, 2-4d is to agent orange as water is. Being a component in a formulation no more makes that component interchangeable with the final formulation than singing karaoke makes you a rock star. I dont use herbicides but I know my chemistry. You’re right, 2,4-d was one component of Agent Orange, the other being 2,4,5-T, another auxin analog. I have peripheral neuropathy as a result of Agent Orange exposure in Viet Nam. All chemical ‘**cides” should be avoided as much as possible. I would rather cut a worm out of one of our apples than ingest an insecticide. Same with composting and mulching. Much rather use leaves from our maples, pecans, apples, pears, etc than commercially obtained straw or some other materials. What about municipal wood chips? My town has a wood chip pile, which does not include treated lumber, but it does include brush. I’m wondering if there’s any chance that brush would be treated with herbicides (roadside or powerline brush, for example). Any ideas? My town composts the wood chips with wastewater sludge. 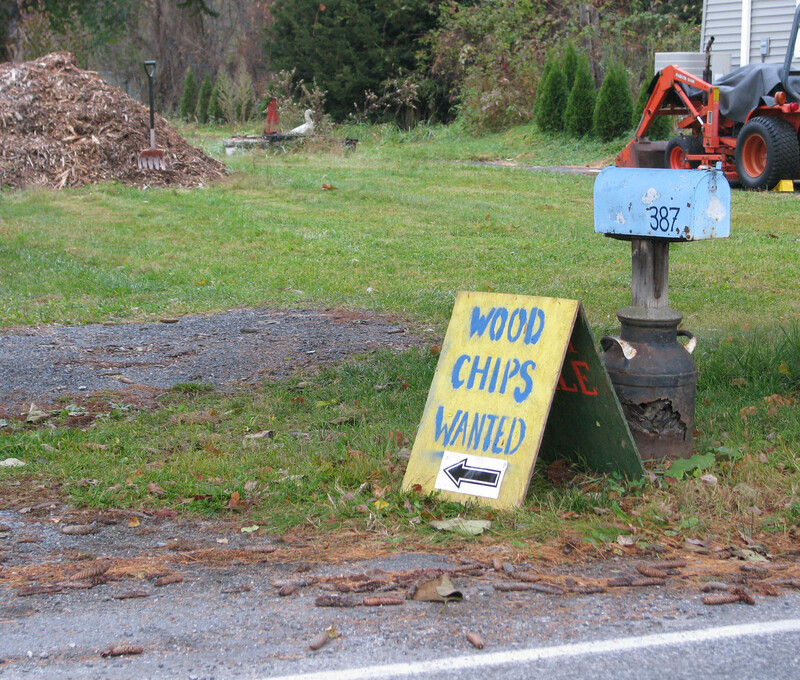 They might be willing to part with some, but now I’m wondering if I really want the mystery wood chips. I would use the wood chips. If they used herbicide the plants probably would not have needed to be chipped. You can always ask.